Billerica, Massachusetts – Broadcast Pix™ today announced a partnership with Automated Data Systems to offer integrated news automation systems designed for the growing number of micro stations, Web broadcasters, universities, and others that need a professional but affordable system for news production. 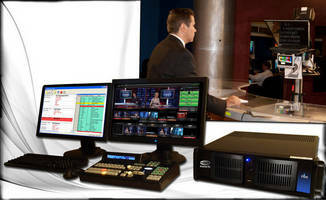 Priced from under $15,000 and available now, the systems include the award-winning Broadcast Pix Flint™ live production and streaming system, new EZNews LT news production software from Automated Data Systems, and exclusive interface software that enables EZNews titles to automatically flow into the Flint's built-in CG. Integration for larger Broadcast Pix models and more robust EZNews systems was also announced. The new system is a fraction of the cost of a traditional news control room and can be run by a small crew or even a single person. Flint includes a production switcher, clip server, Harris Inscriber CG, macros, customizable multi-view, robotic camera control, and a choice of control surfaces. It can incorporate content from cloud-based sources – such as Twitter, Skype, RSS feeds, Skype, and Dropbox – and output six broadcast formats while streaming and recording. EZNews LT software provides highly integrated scripting, show building/rundowns, timing, prompting, and real-time, on-air show control. The interface software allows a reporter or producer to enter CG content while scripting, then, with a one-click upload, automatically play out titles and graphics on the Flint CG. "Our partnership with EZNews really grew from the successful deployment of our products by stations that needed affordable automated news production systems," said Steve Ellis, Broadcast Pix CEO. "Today's new package is perfect for colleges, companies, Web broadcasters, micro stations, or any organization that wants the polished look and operation of a live news show without the big price tag." "Broadcast Pix is a great integrated platform for EZNews," added Bill Sacia, president, Automated Data Products. "EZNews LT adds the proven application for planning and creating highly professional live news content." EZNews LT is available in single user, three-user, and six-user configurations, as well as larger versions. The Flint system supports up to six cameras, but other Broadcast Pix systems that handle up to 22 cameras can also be paired with EZNews LT. All models are available now in North America. About Automated Data Systems ADS is dedicated to providing the producers of TV (Web, Merged Media, too) News, Public Affairs, and similarly structured Programming with state-of-the-art solutions for the preparation, creation, production, and airing of these Shows in an efficient, affordable, and, yes, easy manner. ADS Founders and staff bring a wide range of experience, with extensive backgrounds in journalism, broadcast management, computer system sales and support, and software development. ADS is a Wisconsin Corporation, with business offices, programming and technical support facilities located in historic La Crosse, Wisconsin, USA. Find out more at www.autodatasys.com. About Broadcast Pix The leader in live video production systems with end-to-end integration, Broadcast Pix was founded in 2002 and has customers in more than 110 countries. Its systems combine an integrated switcher, clip server and CG. They ingest cameras, files and cloud-based content, and create compelling video with patented production control surfaces and software. The product line ranges from compact systems controlled by touch-screen, iPad or voice automation to large sophisticated control panels. Customers include leading streaming, broadcast, sports, corporate, education, religious, and government studios. Learn more at www.broadcastpix.com. Broadcast Pix, Flint, Mica, Granite and Fluent are trademarks of Broadcast Pix, Inc. Patented. Made in USA.